If you not started with Java 8 yet then you should make it one of your new year resolution for this year. In the years to come, you will see much more adoption of Java 8. If you are looking for a good book to learn Java 8, then you can use Java 8 in Action, one of the best book about lambda expression, stream and other functional aspects of Java 8. And, if you are new into Java world then I suggest you to start learning from Java 8 itself, no need to learn from old Java version and using age-old techniques of doing a common task like sorting a list or map, working with date and time, etc. If you need some help, you can also look at comprehensive online Java courses like The Complete Java MasterClass, which will not only teach you all this but much more. It's also most up-to-date course, always updated to cover latest Java versions like Java 11. For now, let's see a couple of examples of forEach() in Java 8. Now you know a little bit about the forEach() method and Java 8, it's time to see some code examples and explore more of forEach() method in JDK 8. Btw, now you cannot use method reference now because we are doing something with lambda parameters. Let's see another example of the forEach() method for doing filtering of elements. If you want to learn more about loops in Java, The Complete Java MasterClass is the most comprehensive course for Java programmers. One of the main features of Stream API is its capability to filter elements based upon some any condition. We have already seen a glimpse of the powerful feature of Stream API in my earlier post, how to use Stream API in Java 8, here we will see it again but in the context of forEach() method. This is cool, right? You can read the code like cake, it's much easier than using Iterator or any other ways to loop over List in Java. Apart from forEach, this is also a good example of using the filter method in Java 8 for filtering or selecting a subset of elements from Stream. You can read more about that in the Collections to Streams in Java 8 Using Lambda Expressions course on Pluralsight, which provide an in-depth explanation of new Java 8 features. So far you have both basic and advanced example of using the forEach() method, first with simply iterating over each element and then along with using the filter() method, Let's see one more example of forEach() method along with the map() function, which is another key functionality of Stream API. If you want to learn more about functional programming in Java 8 and using map, flatmap methods then I suggest you go through Java SE 8 New Features course on Udemy. It's a nice course and packed with good examples to learn key Java 8 features. * Java Program to show How to use forEach() statement in Java8. * can run the loop in parallel. // let's now only print elmements which startswith "a"
1) The forEach() is a terminal operation, which means once calling forEach() method on stream, you cannot call another method. It will result in a runtime exception. 2) When you call forEach() on parallel stream, the order of iteration is not guaranteed, but you can ensure that ordering by calling forEachOrdered() method. 3) There is two forEach() method in Java 8, one defined inside Iterable and other inside java.util.stream.Stream class. If the purpose of forEach() is just iteration then you can directly call it e.g. list.forEach() or set.forEach() but if you want to perform some operations e.g. filter or map then better first get the stream and then perform that operation and finally call forEach() method. 4) Use of forEach() results in readable and cleaner code. That's all about how to use forEach() in Java 8. By following these examples, you can easily get to speed with respect to using the forEach() method. 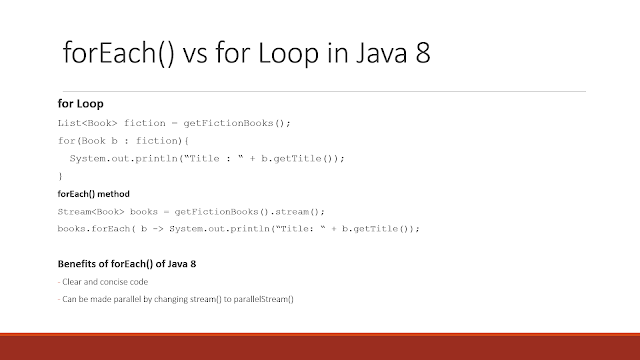 It's perfect to be used along with stream and lambda expression, and allow you to write loop-free code in Java. Now, one task for you, how do you break? Does forEach() method allow you to break in between? If you know the answer posts as a comment. P.S. 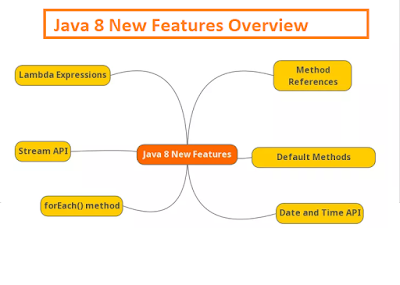 : If you want to learn more about new features in Java 8 then please see the tutorial What's New in Java 8. It explains all important features of Java 8 e.g. lambda expressions, streams, functional interfaces, Optional, new date, and time API and other miscellaneous changes. The best article that explains streams easily.